Among the requirements needed to keep commercial fire sprinklers working and up to code, the routine inspection aspects alone are complex. But while much of the testing and maintenance requires the services of a life safety professional, many inspections can be done by knowledgeable facility managers. The National Fire Protection Association (NFPA) has outlined these requirements in NFPA 25: Standard for the Inspection, Testing, and Maintenance of Water-Based Fire Protection Systems. This series will outline the major steps that should be taken to inspect a commercial fire sprinkler system, why they are required, and how to deal with any issues that are spotted. Are you looking to buy parts for your commercial fire sprinkler system? If so, feel free to skip directly to our selection of commercial fire sprinkler heads, cover plates, escutcheons, and other components and tools, or just use the search bar at the top of the page to find what you’re looking for. 5.2.1.1 Sprinklers shall be inspected from the floor level annually. 5.2.2* Pipe and Fittings. Sprinkler pipe and fittings shall be inspected annually from the floor level. Since each of these components must be inspected at the same interval and they can be viewed together, you can knock out both requirements during the same inspection. This piece will cover the annual inspection of sprinklers, whereas our next blog in the series dives deep into the inspection of pipe and fittings. There are five things you are looking to spot: Damage, incorrect orientation of a sprinkler head, missing sprinklers or components, proper clearance between sprinkler heads and any objects, and that your stock of replacement components and tools is adequate. Obviously, leakage that can be spotted by a visual inspection will involve looking for signs of water when it involves a wet system. Any noticeable physical damage also obviously requires correction. Corrosion that could be detrimental to sprinkler performance includes build-up and/or degradation that interferes with the operation of a sprinkler head. Also, closely look at the translucent, heat-responsive elements (in sprinklers that have them) to see if the fluid is missing or low. The liquid is most often red in color, but it could be orange, yellow, green, blue, or purple, depending on the sprinkler’s temperature rating. Without this fluid, the glass will not break when exposed to high temperature, which means the sprinkler will not deploy during a fire. Make sure the heat-sensing element in a fire sprinkler still contains colored liquid. “Loading” refers to accumulated dust or other sediment on a fire sprinkler; if this gets too heavy, the accumulation can shield the heat-sensitive element from high temperatures or gum up the deflector. Essentially, determining how much loading affects the response times of sprinklers is hard to estimate visually, and the decision to replace or simply clean sprinklers is a “subjective call.” Thus, the author’s recommendation is to treat any significant loading as “detrimental” to the performance of the sprinkler head – which would require a replacement. If there is a light covering of dust, the head can simply be cleaned; see our guide to cleaning a sprinkler head. In the case of spotting a painted sprinkler, default to replacing the sprinkler head. Painted-over cover plates on concealed sprinklers can block sprinkler deployment, and a painted heat element in any head will shield the heat-sensitive liquid from detecting the temperature – also delaying or stopping deployment. Paint can also gum up the deflector, preventing it from fanning water throughout the intended coverage area. Sprinkler heads must be positioned correctly to deliver water over the area that is specified by the system’s design. 5.2.1.1.2 Any sprinkler that has been installed in the incorrect orientation shall be corrected by repositioning the branchline, drop, or sprig, or shall be replaced. Sprinklers could be placed incorrectly during installation – such as those that face the wrong way or at the wrong angle – or their orientation could become incorrect due to changes in the environment. For an example of the latter, drop ceilings that settle over time could come to obscure the water delivery of a sprinkler. This illustration from International Fire Protection Magazine shows how a drop ceiling can cause the improper orientation of a sprinkler head (right). Check out the article for a thorough examination of the issue. NFPA defines a “sprig” as “a pipe that rises vertically and supplies a single sprinkler.” NFPA 13 mandates that a sprig that is greater than 4 feet long “shall be restrained against lateral movement” (9.3.6.6). Thus, a broken or missing restraint on a long sprig that winds up moving laterally is one of the ways a sprinkler can get out of alignment. An arm-over is a “horizontal pipe that extends from the branch line to a single sprinkler or a sprinkler above and below a ceiling,” whereas a return bend is any section of pipe that changes the water’s direction by 180 degrees. A fire sprinkler drop is any pipe or tube that connects and drops the sprinkler head from the branch line that supplies it with water. To compensate for potential orientation issues – some of which could result from the settling of drop ceilings mentioned above, as well as incidental impact or earthquakes – various manufacturers have created flexible drops that allow sprinklers to be repositioned without having to cut and replace pipe. In any case, each of these elements must be inspected to make sure that the sprinkler is oriented the right way. If an issue is spotted, it must be fixed. Failure to do so means an intended area is not being covered, which means a fire could gain enough time and fuel to spread. 5.2.1.1.5 Escutcheons and coverplates for recessed, flush, and concealed sprinklers shall be replaced with their listed escutcheon or coverplate if found missing during the inspection. 5.2.1.1.5.1 Where the listed escutcheon or coverplate from a listed assembly is missing and is no longer commercially available, the sprinkler shall be replaced. 5.2.1.1.6 Escutcheons for pendent sprinklers that are not recessed, flush, or concealed shall not be required to be replaced if found missing during the inspection. If either escutcheons (the decorative rings that fill the gap around a sprinkler head and the ceiling) or cover plates (which cover concealed sprinkler heads behind an aesthetic plate) are missing, they could impact the intended performance of the sprinkler. Missing escutcheon’s impair “the ability of the ceiling to resist the passage of smoke or heat” and “the sprinkler head (or smoke detector, if so installed) may not operate in a timely manner.” Think of it this way: If smoke has an escape route through the gap around a sprinkler caused by a missing escutcheon, it may accumulate less and delay setting off any detectors. A chrome escutcheon that can surround a flush or recessed fire sprinkler head. Missing, damaged, or improperly installed cover plates (which usually have an activation temperature about 20 degrees lower than the sprinkler’s, so they drop away first) can have a similar impact on sprinkler activation. The sprinklers can still activate without one present, but the system is designed with the assumption that they are there – and cover plates may be intended to protect sprinkler heads from incidental damage as well as for aesthetic reasons. 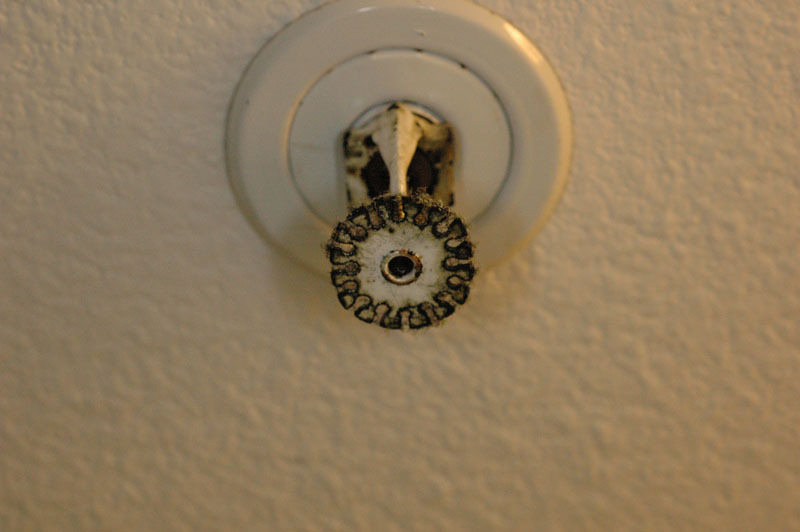 Thus, replace both escutcheons and cover plates if they are missing or damaged, except in the case of a missing escutcheon for a pendent sprinkler that is meant to be exposed (not recessed, flush, or concealed). If a replacement part compatible with a specific sprinkler is no longer manufactured, you’ll have to replace the entire sprinkler head with a new version. You can find a selection of escutcheons and an array of cover plates at QRFS. 5.2.1.2* The minimum clearance to storage as described in 5.2.1.2.1 through 5.2.1.2.6 shall be maintained below all sprinkler deflectors. 5.2.1.2.1* Unless greater distances are required by 5.2.1.2.2, 5.2.1.2.3, or 5.2.1.2.4, or lesser distances are permitted by 5.2.1.2.6, clearance between the deflector and the top of storage shall be 18 in. (457 mm) or greater. 5.2.1.2.2 Where standards other than NFPA 13 specify greater clearance to storage minimums, they shall be followed. 5.2.1.2.3* Clearance between the deflector and the top of storage shall be 36 in. (914 mm) or greater for special sprinklers. 5.2.1.2.4 Clearance from the top of storage to sprinkler deflectors shall be 36 in. (914 mm) or greater where rubber tires are stored. 5.2.1.2.5 In-rack sprinklers shall not be required to meet the obstruction criteria and clearance from storage requirements. 5.2.1.2.6* Clearance between the deflector and the top of storage shall be permitted to be less than 18 in. (457 mm) where shown to be permitted by the installation standard. 5.2.1.3* Storage closer to the sprinkler deflector than permitted by the clearance rules of the installation standard described in 5.2.1.2.1 through 5.2.1.2.4 shall be corrected. Stored rubber tires must also be at least 36 inches away from the sprinkler. Since in-rack sprinklers are actually embedded in a storage rack to specifically protect items in warehouses, they do not need to meet these clearance requirements. If “standards other than NFPA 13 specify greater clearance to storage,” follow them. These standards are essentially the local building and life safety codes adopted by your jurisdiction, so look them up. Chances are that they will match NFPA code, but make certain of it. The final aspect of the annual sprinkler head inspection is making sure you have adequate replacement sprinklers plus the tools to install them on hand. Having spares is essential because if a sprinkler head is damaged or completely broken off, it can actually deploy the system or render it entirely ineffective. At a minimum, the inoperable sprinkler will not be able to cover its intended area. The sprinkler head must be replaced immediately. 5.4.1.5* A supply of at least six spare sprinklers shall be maintained on the premises so that any sprinklers that have operated or been damaged in any way can be promptly replaced. 5.4.1.5.1 The sprinklers shall correspond to the types and temperature ratings of the sprinklers in the property. 5.4.1.5.3 Where dry sprinklers of different lengths are installed, spare dry sprinklers shall not be required, provided that a means of returning the system to service is furnished. 5.4.1.5.5* One sprinkler wrench as specified by the sprinkler manufacturer shall be provided in the cabinet for each type of sprinkler installed to be used for the removal and installation of sprinklers in the system. The most important aspects of these requirements are that you have the minimum number of replacement sprinklers on hand according to 5.4.1.5.4 and that they match the performance characteristics of the sprinklers they would replace in the system. Ideally, they will be the same model from the same manufacturer. You must also have the right wrench to quickly install them. An open-end fire sprinkler wrench. Different fire sprinklers require different, compatible wrenches. 5.4.1.5.6 A list of the sprinklers installed in the property shall be posted in the sprinkler cabinet. 5.2.1.1.3* Sprinklers installed in concealed spaces such as above suspended ceilings shall not require inspection. 5.2.1.1.4 Sprinklers installed in areas that are inaccessible for safety considerations due to process operations shall be inspected during each scheduled shutdown. This concludes part one of our review of the inspection requirements for commercial fire sprinklers. In the next installment of this series, we discuss the steps needed for an annual visual inspection of pipe and fittings. If you have any questions about commercial fire sprinklers or need help finding an item, add a comment below, give us a call at 888.361.6662, or fill out our contact form and we’d be happy to assist.